Blogging every day. 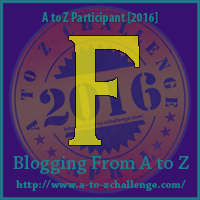 It begins on April First with a topic themed on something with the letter A, then on April second another topic with the letter B as the theme, and so on until I finish on April thirtieth with the theme based on the letter Z. The theme of the day is the letter scheduled for that day. This is a fictional piece. On a chilly, early spring morning, Fran sat on a freshly painted, dark green bench and looked out at the ocean. The bench was anchored onto a wooden deck set high up on the man-made dunes. Normally she would have walked along the water, picking up shells, but the beach was terribly eroded from destructive winter storms and there was a ten foot drop down onto the shore line. She closed her eyes and let the ocean breeze carress her face. Her hands snuggled in the warmth of the wool of her well worn fingerless gloves, her bare fingers wrapped around a white styrofoam cup of steaming hot tea. The gloves, cherry red when they were new, had now faded into a rusty shade of their former brightness. She reflected on how much her life had changed since the day Gina gave her the gloves. "Ah, Gina," she sighed and looked at her watch. Fran finished the last of her tea. She better hurry, she thought. She did not want to be late. Today was Gina's last day. They were going to surprise her with a cake and presents. Of course, Fran susprected that Gina wouldn't be all that surprised. After 25 years at the half-way house, it was hard to pull the wool over her eyes. She stood up and noticed a man coming down the beach. He was bent over, carrying an army green tackle box and fishing pole in one hand and dragging along a large blue cooler with the other. He spotted her and began to wave. As she turned to leave, she carelessly waved back. Fran began to walk down the wooden ramp when she thought she heard her name being called. Startled, she froze. There was only one person who ever called her Frankie. Oh.....this is interesting....will we ever know who was calling her by Frankie? Depends on how ambitious I am. Perhaps. How can I say no to all of those pleases :) Thanks for liking it. You definitely have my attention. I'm glad I came by. Thanks for stopping by. I'm glad I got your attention! Spoiler alert, no, not tomorrow. Very intriguing move there with that open end.